Be the first to share your favorite memory, photo or story of JoDee . This memorial page is dedicated for family, friends and future generations to celebrate the life of their loved one. 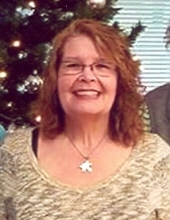 JoDee Riordan, age 56 of Boone, died July 18, 2018 at the Israel Family Hospice House in Ames. Following her wishes, JoDee has been cremated. A Celebration of JoDee’s Life, will be held Saturday, July 21, 2018 from noon until 2 p.m. at the Shelter House in McHose Park. The event will be potluck of food and beverage and a gathering of JoDee’s family and friends. A private family graveside service and burial will be in the Sacred Heart Cemetery in Boone. JoDee Ann Riordan, was born in Boone, Iowa on September 20, 1961, the daughter of Robert and Janice (Neely) Riordan. She graduated from Boone High School in 1980. For 36 years, JoDee worked as an administrative assistant in the Boone, Dallas, and Story County Human Services Office. She was an avid fan of the Dallas Cowboys, and, like her father, the Iowa Hawkeyes, enjoyed cooking and baking, calla lily flowers, and she especially loved spending time with her nieces, nephews, great nieces, and great nephews. JoDee was a member of the Loyal Order of Moose, Lodge Chapter 209 of Boone. She is preceded in death by her parents. JoDee is survived by two brothers, Mike Riordan and wife, Leah and Jerry Riordan and wife, Tammy, all of Boone; two sisters, Bobbi Carlson of Urbandale and Cindy Waters and husband Greg of Boone; her companion Randy Olsen of Boone and his children; her nieces, nephews, great nieces and great nephews, aunts, uncles, cousins, and other relatives. JoDee is also survived by her two babies, Sophia, her toy poodle and Quincy, her cat. In lieu of flowers, memorials may be directed to the Bliss Cancer Center, c/o Mary Greeley Medical Center in Ames. To send flowers or a remembrance gift to the family of JoDee Riordan, please visit our Tribute Store. "Email Address" would like to share the life celebration of JoDee Riordan. Click on the "link" to go to share a favorite memory or leave a condolence message for the family.